Check out the best marine stereo equipment available in Melbourne and Palm Bay. You will find JL Audio speakers in Brevard's finest boats... and in the best sounding ones, too! We are the marine audio and stereo installation experts in Melbourne and Brevard. Contact us for all your marine audio installation needs. Upgrading the existing radio in your boat can dramatically improve the sound as well as give you the awesome convenience features like bluetooth audio streaming, internet radio like Pandora and Spotify, and satellite radio Sirius XM. Upgraded radios also give you the connections to easily upgrade the rest of your boat's stereo system like adding speakers and amplifiers. 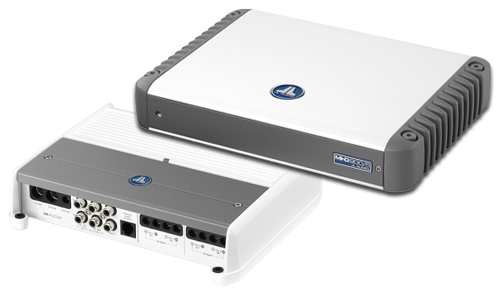 A aftermarket amplifier ranges from 70-150 watts of power. While a larger amplifier will increase the volume, a good quality amplifier will increase the sound quality at the same time. Unfortunately not all amplifiers are created equal. We utilize the best quality amplifiers to withstand many years of use & have amazing sound that you will enjoy for thousands of hours. If you're tired of replacing cheaply made speakers every year and want to step up to a quality marine listening experience, you have found the right place in Melbourne to make it happen. Purpose-engineered and built for real marine duty, the M-Series component systems deliver maximum audio performance in any open-air boating environment. You have a speaker system truly capable of playing loud and clear in a powerboat at speed. Specifically optimized models are available for cockpit panel-mounting and small enclosure mounting (i.e. wakeboard boat tower systems) to ensure superior bass performance in each application. To achieve the best low-frequency performance in real-world, open-air marine environments, you need a specialized subwoofer driver. 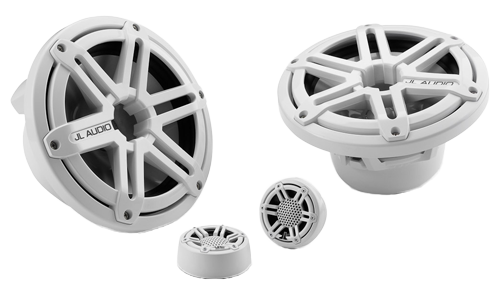 This is why we offer the M-Series subwoofers in two distinct versions. The M8IB5, M10IB5 and M12IB6 subwoofers are optimized for high-power, infinite-baffle operation and can be installed in a variety of locations, without the need for a dedicated enclosure behind it. 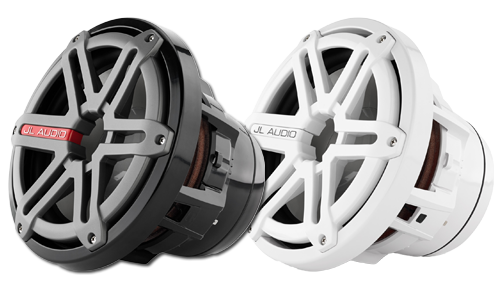 JL Audio has tackled the challenges of marine amplifier design with the same commitment to engineering and innovative thinking that we apply to our speaker designs. For us, it isn't enough to repackage circuits and technologies that have been around for decades... our customers expect more. 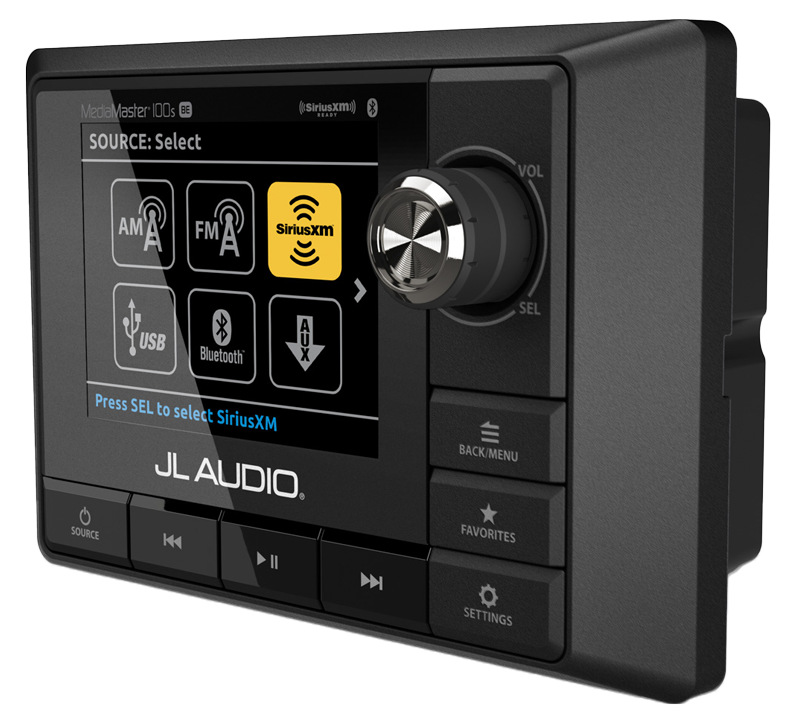 Whichever JL Audio marine amplifier you choose, you are getting a serious product designed to make great audio in your vessel. Professional marine audio installation in Melbourne at a level of quality you cannot receive anywhere else! With MediaMaster®, bringing your playlist on your next adventure on the water has never been easier! Enjoy great audio wherever your adventures might take you, with the MediaMaster® 100s-BE, a Premium Source Unit designed to withstand anything Mother Nature can dish out. This full-featured source unit offers great audio performance and is ideal for marine and powersports applications. Its rugged, weatherproof (IP66 rated) chassis houses an ultra-bright, 3.5-inch full-color LCD display, with separate Day/Night lighting themes for outstanding visibility, even in bright sunshine. When in motion, you will also appreciate the clean user interface with big text and large backlit controls. Because sound quality is our top priority, the MM100s-BE is not equipped with an internal amplifier designed to drive loudspeakers directly. Instead, it offers audiophile-quality circuitry to deliver crystal-clear signals to high-quality marine amplifiers, through eight preamp outputs. These are deployed in four configurable, nameable audio zones, each offering its own set of independent control options, making the MM100s-BE adaptable to a wide range of system types. On-the-fly, zone volume controls make it easy to adjust the level of your audio zones, while a useful zone volume limit feature makes sure that nobody gets blasted inadvertently. All zones feature our Zero-Clipping audio circuit design, with self-limiting tone controls to keep the audio clean at high listening levels, reducing the likelihood of speaker damage. With certified NMEA-2000® connectivity, the MM100s-BE is also an ideal partner to your Garmin, Lowrance or Simrad Multifunction Display!